« Is Ghatak UCAV Program getting prioritized over AMCA? India’s longest-range Intercontinental ballistic Agni-V missile is just one test away from been officially inducted into the nuclear arsenal of the country, but the successor program is nowhere to be seen even though DRDO almost 5 years ago had confirmed it has all the building blocks to develop next longest-range ballistic missile. While DRDO and Defence Ministry have not acknowledged but sure have denied the existence of any Agni-VI program but off late media reports do hint that program doesn’t have the political backing in light of maintaining continuous International backing to the country’s Nuclear program which has received a major boost after several agreements of cooperation were sealed with many countries off late. Agni-VI was supposed to be Country’s first multiple independently targetable reentry vehicle (MIRV) capable intercontinental ballistic missile with a range of 6000-8000 which with MIRV could have breached 9000km mark which far exceeds India’s nuclear strike capabilities. Only Two long-range ballistic missiles which have been cleared for development are K-5 and K-6 Submarine-launched ballistic missile which will have a range of 5000 and 6000 respectively. K-6 which got approval only in last few years is still 4-5 away from coming anyway closer to the trials and could become India’s first MIRV equipped ballistic missile if Agni-VI fails to become a reality by then. India’s current SLBM K-15 (700km) and K-4 (3500km) Both have been successfully tested and have been cleared for operational roles. since Nuclear ballistic submarines hide thousand of miles away from their home port to provide credible second strike capabilities to the country any long-range ballistic missiles even over 10000km is totally justifiable and is unlikely to raise eyebrows of the west. Unlike Agni series ballistic missile program, India’s SLBM program has maintained a high level of secrecy and development of the missiles system are only known to the public only after the missile is closer to become operational. Pictures of K-4 and Second Nuclear Ballistic missile submarine is yet to make into public which allows India to hide true capabilities of both systems from defense analysts and missiles experts around the world while allowing India to continue its SLBM program under the radar. unlike its Agni missile program which received wide-scale attention of the western media and that of their leaders. 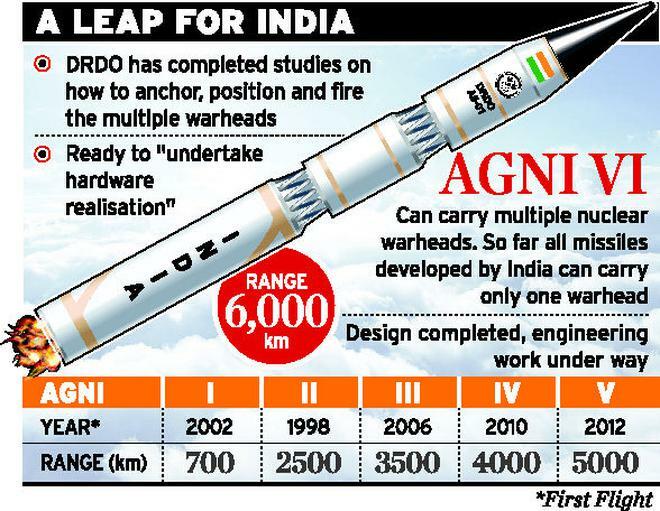 Agni-V might be last of the long-range missile coming from the Agni-series but won’t be last of the newer inductions. India is already working on Agni-1P which will replace 70’e era Prithiv Short ranged Surface to Surface ballistic missile which will have a range of 150-300km. Talks are also in place to replace Agni-II with newer more modern successor which will incorporate advanced technologies which have already been developed for Agni-V.
DRDO is also planning to develop a new canister launch system for Agni-III and Agni-IV and Agni-1P too will feature such system. DRDO is also proposing developing a new Agni-V with MIRV capabilities which will be China-centric but with lesser payload capabilities. Agni missile series will continue to get improvements and upgrades and even might be replaced by newer successors which will replace older missiles in the near future but till now there is no indication that Agni-VI or anything beyond will be coming anytime soon.